SINGAPORE: The organisers of South East Asia’s largest music festival, Future Music Festival Asia 2015 (FMFA), Livescape Singapore and Future Music Group Australia today announced the full line up for this year’s star-studded music festival. Complementing this stellar line-up are Singapore’s own homegrown talents and regional names such as Lion City Boy, Oliver Osbourne, Indiego & Co. x Poptart, Goldfish & Blink and Glen Check, adding spice to the already electrifying ensemble. These world-class acts will be performing across three stages for the heart-thumping two-day Festival, which is set to take over Singapore’s 140,000-square-metre Changi Exhibition Centre, from 13 to 14 March, 2015. Having attracted over 55,000 people from 85 countries at FMFA 2014 held in Kuala Lumpur, Malaysia, its debut in Singapore is expected to be quite the spectacle. “Singapore was the obvious destination of choice, because we recognize its value as an international hub and up-and-coming center for music and entertainment in South-east Asia. With Singapore’s vibrant calendar of world class events, and exceptional infrastructure, it was only natural for it to be FMFA’s next home,” Muhammad Iqbal, Group Chief Executive Officer of The Livescape Group said. “We have never spared any expense in offering our loyal fans the best event experience they can get, and we aren’t about to stop now. In addition to the star-studded cast of international, regional and local acts, we also look forward to having a few more little surprises in store for all festivalgoers on-site. With this, we are well placed to create a truly memorable, world-class event to commemorate our Singapore debut, and in keeping with this country’s aim of becoming a world-class entertainment destination,” Iqbal added. For the first time in South East Asia, FMFA will also be working with world-renowned stage designer, James Klein (www.jameskleinevents.com) to curate its main stage, dubbed the Supernova Stage. James Klein has previously worked on the stage designs for the likes of Ultra Music Festival and Sensation. 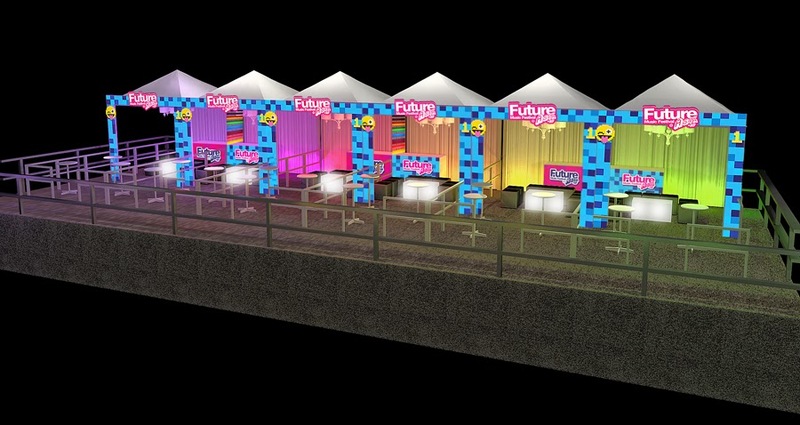 The multi-storey Supernova Stage at FMFA 2015 will be one of the largest South East Asia has ever seen and is especially customised and built specifically for the festival. The stage includes never before seen pyrotechnics and visuals and extensive giant LED screens. Bearing in mind FMFA’s location in the Far East, organisers will be providing FREE shuttle services, which will ferry revellers to and from a soon to be announced location within the city centre at 30-minute intervals either way. This will take place throughout the entire duration of the festival with at least 40 – 45 forty-seater shuttle buses on standby. Aside to this, GrabTaxi has come on board as the Official Taxi Partner for FMFA 2015 and will be operating a taxi booth at the entrance and exit points of the festival grounds to assist festival-goers in booking their taxi rides. GrabTaxi will also be offering special discounts to all festivalgoers that book a ride using the GrabTaxi app and the promo code “FMFA15”. To add to the spectacle of the festival, several carnival elements will be introduced to ensure revellers get a holistic experience. Several carnival rides will be set up including a Carousel, Bumper Car Ride, Gryospin Ride, Meteorite and a never before seen in Singapore, Stage Dive. Also there will be sections where partygoers can rest and recharge with hammocks and bean bags which will be located close to an extensive food village which will feature some of the best food operators from Singapore, Malaysia and even Thailand. For those looking to take their party experience to a different level, they could literally do so with the VVIP Private Cabanas going at SGD10,000 each for two-days. These elevated cabanas apart from providing an aerial view of the festival grounds and a fantastic view of the main stage comes with a 250 sq. ft. private area, access to the cabana for 15 people, private bars, private toilets and 4 bottles of liquor with mixers for both days. In addition to this there will also be a VIP Lounge – The First Class Arena – which features an elevated terrace and lounge that overseas the Supernova and Future Live stages. VIP tickets are priced at SGD388. This VIP Lounge will act as a club within the festival and is indoors, air-conditioned, and also includes its own private toilets. Also there will be a variety of exclusive services in the VIP Lounge such as bottle service, foot massages and even food catering.